Increases the variety and amount of food that innkeepers have for sale as well as sets some items to always be available. Meant to be used with iNeed. If you use parts of this in your own mod, make sure to also give perseid9 credit, because his edits are used in this file. The CACO patch is not compatible with CACO 2.0+. Do not use this mod with CACO 2.0+. This mod gives the innkeepers various foods that were already in the game but locked behind HF, were only available in one place, or were for some other reason not available, like crostatas, various stews and soups, mammoth steak, etc. It also forces inns to carry a few common items such as bread and salt at all times. I made this to be used with iNeed because I was disappointed in how unrealistic the amount of food inns had was and how they sometimes didn't have basic items for sale. 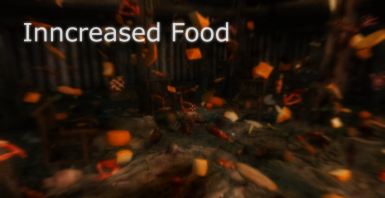 Intended for use with mods that add NPCs to inns and towns, so having more food makes sense. Unofficial Skyrim patch and Unofficial Hearthfires patch OR Unofficial Skyrim legendary edition patch. There will never be a version that doesn't require DLC and one of the unofficial patches. Install with a mod manager, pick the correct main and optional files in the installer. Generate a bashed patch with Wrye Bash. If you don't know how to do that, here is a guide. Innkeepers will now always have breads, cheeses, salt, stew, and either grilled leeks or baked potatoes. They will carry a greater variety of food and drink, and in greater quantity. Inns in big towns will have more food than rural ones do. I also have many mods that add NPCs to inns, so having more food fits. New Gnisis club will now have drinks from Dragonborn DLC available. The Bee and Barb will no longer serve Honninbrew mead. The food stall vendors Carlotta, Jala, Marise, and Hillevi have been changed. They now have more farm products for sale. Marise also sells meat and cooked food. If your mod-added inns use the same general inn food list, they will benefit from the increased variety, but nothing else. Only leveled lists and merchant chests are edited. The Retching Netch is untouched. My edits are based on Realistic needs and diseases by perseid9 and are used with permission as they declared it free to use here. 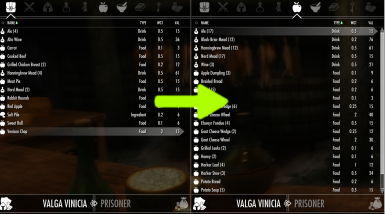 This is compatible with other mods that add food to inns as long as they stick to editing the leveled lists. Any mods that conflict with my leveled lists can be made compatible by following the installation procedure. If a mod edits the merchant chests themselves, generate a TES5EDIT merged patch to fix the problem or ask for a patch in the comments. I might just make one if it's simple enough to do and I'm in the mood. Complete Alchemy and Cooking Overhaul - there's a patch for it in the installer for versions before CACO 2.0. DO NOT USE THIS WITH CACO 2.0+. If you CTD on launch, make sure you have the right requirements and make sure all patches come after the plugins they're patching. Nothing else related to this file should cause a CTD.